The 2016 Mazda MX-5 Miata Is Brightening Up Myrtle Beach! Some cars are all style but no substance: they give you a sleek exterior design, a wealth of accessories, but no engine power. Other cars are all substance but no style: they boast high-powered performance and top-rated efficiency, but they lack any semblance of brio, verve, or elegance. Yet once in a blue moon, a vehicle appears that combines substance with style, power with panache, performance with an alluring design. 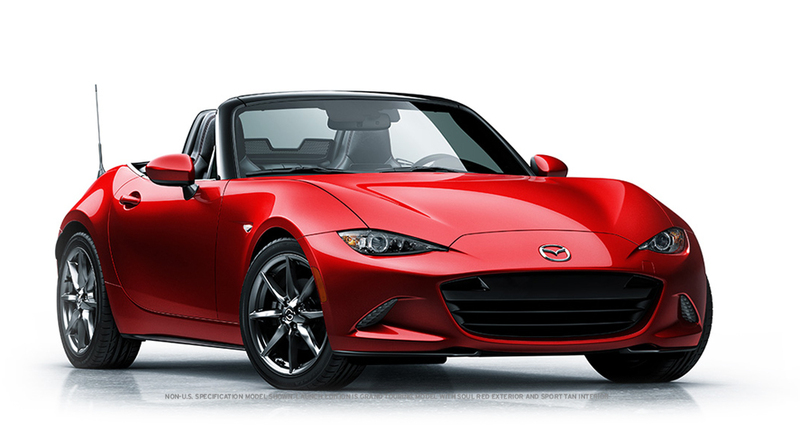 And we at Beach Mazda are proud to announce its arrival at our dealership: meet the 2016 Mazda MX-5 Miata. Powered by a magnificently mighty engine and promising expert handling and excellent efficiency, the 2016 Mazda MX-5 Miata covers all the bases when it comes to engine performance. At the same time, though, this is a truly gorgeous sports car, the likes of which we have rarely seen, and which must be experienced to be believed. Even so, let’s check out what makes the 2016 Mazda MX-5 Miata so distinctive. The base-line 2016 Mazda MX-5 Miata Sport is priced at $24,915. The mid-range 2016 Mazda MX-5 Miata Club starts at $28,600. The upper-end 2016 Mazda MX-5 Miata Grand Touring is priced at $30,065. a 2.0L I4 16-Valve Dual Overhead Cam engine with manual transmission that can generate as much as 155 hp and achieve 148 lb-ft of torque, while promising strong fuel efficiency: it realizes 27 mpg in the city and 34 mpg in the highway. At the same time, the Miata is also designed to perform exceptionally well, offering rear-wheel-drive, superb balance, and a light-weight build, thus ensuring maximal speed. But not only is the Mazda MX-5 Miata a powerful machine—it’s also beautifully designed. First—and probably most excitingly—the Mazda MX-5 Miata is a two-seat convertible, providing driver and passenger with the opportunity to roll the top down and bask in the Carolina summer sun as you bolt up the highway to Charleston. But the Mazda MX-5 Miata also features an array of touches, like 17-inch Gunmetal Alloy Wheels, a Wind Deflector, and a Glass Rear Window, to make this already gorgeous vehicle even more striking. And that’s just the outside: inside, the Mazda MX-5 Miata gives you a leather steering wheel, leather-trimmed, front bucket seats, and a generous allotment of cargo volume (4.6 cubic feet), too. MAZDA CONNECT™, which makes it possible for you to plug your phone directly into your Miata, access its apps, your own music, and even send messages via your vehicle. a 9-speaker Bose Audio System, which promises crisp, clear, and powerful sound for your next drive upcountry. and voice-activated controls, which allow you to adjust your settings, choose tracks, and operate your tech-equipment by simply talking to your car. Front side airbags; passenger airbags, and a driver airbag, providing you with a comprehensive system of airbags meant to ensure your own and your passengers protection. Side guard door beams, which strengthen your Mazda MX-5 Miata against a collision, should one occur. a Tire Inflation/Pressure Monitor, which allows you to judge the pressure of your tires without ever leaving the cabin. Visit Beach Mazda Today to Test Drive the 2016 Mazda MX-5 Miata! With a sports car like the 2016 Mazda MX-5 Miata, it’s not enough to read about or even simply see it: you’ve really got to take it out on the road, feel its power, explore its superb handling, and experience its unrivaled speed. Visit Beach Mazda located at 851 Jason Boulevard in Myrtle Beach, contact us online, or reach us by phone at 843-839-8169 to arrange for a test drive today!